Have you heard of Facebook 360 photos? Wondering how your business can use them? Facebook 360 photos let you create an immersive 360-degree experience for fans on your Facebook page. 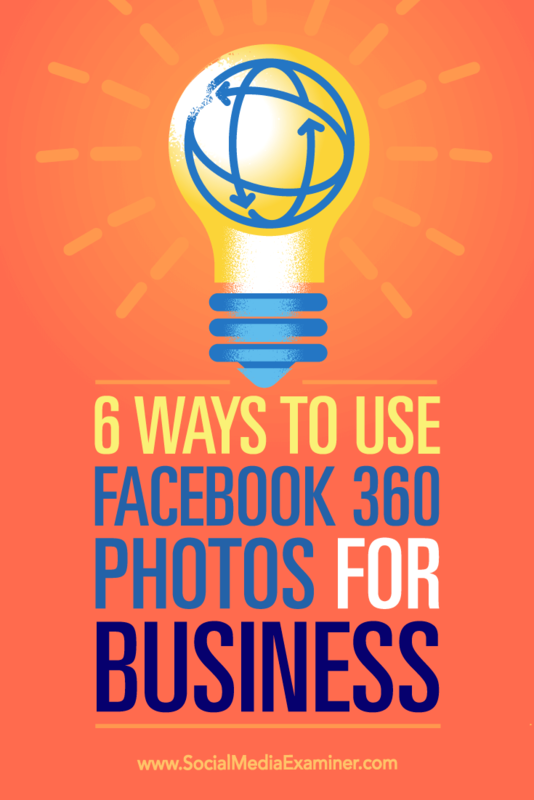 In this article, you’ll discover six ways to use Facebook 360 photos for business. 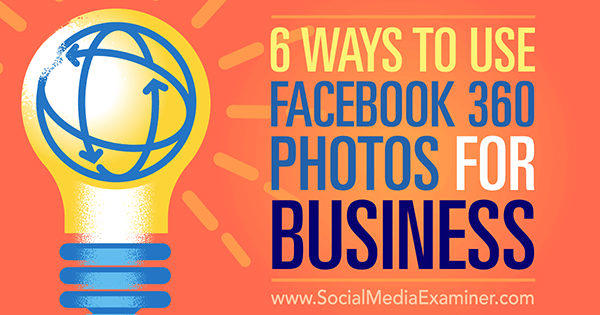 Discover six ways to use Facebook 360 photos for your business. 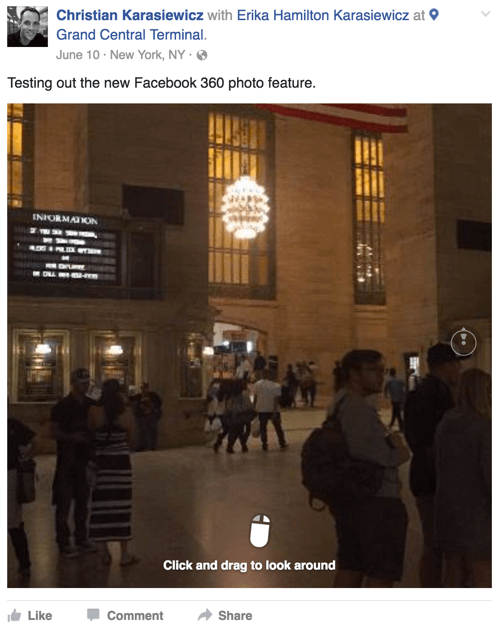 What Are Facebook 360 Photos? Unlike normal photos, Facebook 360 photos let you create a 3D view of your environment. Take a look at a comparison of a normal photo that you might upload to Facebook and a 360 photo of the same scene. First, here’s the normal photo. This is an example of a normal, traditional photo post that’s been published on Facebook. Now here’s the same scene, except this time we took a Facebook 360 photo instead. This is an example of a Facebook 360 photo of the same scene. The mouse icon invites the viewer to literally look around. One thing you’ll notice about a 360 photo is that instead of being flat, it’s much more inviting. It draws you into the scene and makes you feel like you’re a part of the experience instead of just reliving someone else’s. So now that you know what Facebook 360 photos are, here are some ways they can work for your business. Does your business have limited hours? Maybe you just opened your store and customers haven’t yet had the opportunity to experience it? To drum up interest and engagement, share a 360 photo of your business from the customer’s perspective. 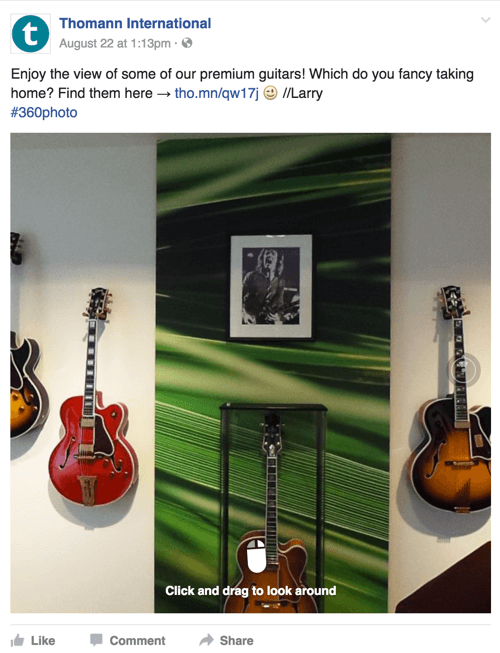 For example, this Thomann International 360 photo lets potential buyers tour the music store’s premium guitar selection. You can use Facebook 360 photos to let your fans and possible customers see the inside of your store, and to promote specialized product departments that might interest them. Before taking a photo inside your store, be sure that the shelves are neatly organized and you have plenty of products in stock. First impressions make a difference. If your store is normally very busy during the day, it might be best to take the photo in your store before you’ve opened or after you’ve closed. Too many customers moving around in the scene can result in a poor-quality Facebook 360 photo. Do you put on events for your business? Incorporate Facebook 360 photos to share from inside the event or behind the scenes. 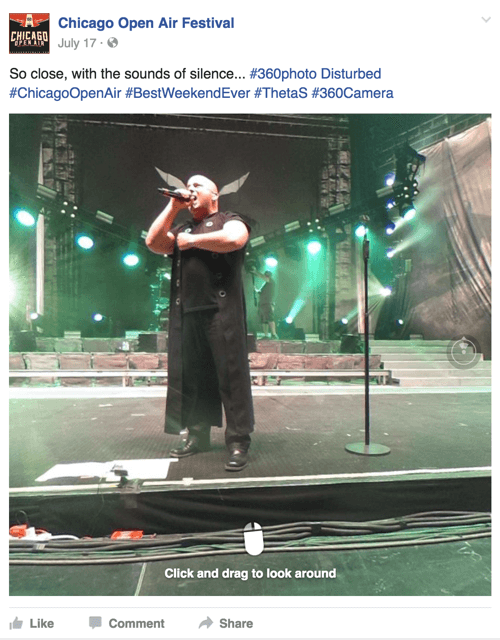 The Chicago Open Air Festival used Facebook 360 photos to give fans a 360-degree view of concerts at the three-day music event. Publish Facebook 360 photos to give people an inside, up-close look at your live event. By sharing a Facebook 360 photo, you give fans an opportunity to experience pieces of your event. If viewers are interested in attending the event, they now have a better perspective on what to expect. If you’re interested in getting more elaborate with the event content that you share, consider creating a Facebook 360 video as well to deepen the overall 360 experience. Do customers frequently call your business to find out where you’re located? Most of the time, businesses tell callers about other landmarks that are nearby, such as the nearest Starbucks. To assist your customers, take a Facebook 360 photo from outside your storefront and show people what’s around your business. Then share the photo on your Facebook page, like Bonnie Burrito did. Bonnie Burrito, a food truck vendor, uses Facebook 360 photos to help hungry people find their truck by showing off the area that surrounds their current location. This way, the next time people ask where you’re located, you can share a link to the Facebook 360 photo so people can pan the area around your store and know exactly what to look for when they’re nearby. If you’re a concert promoter or work for a sports team, you might use this type of Facebook 360 photo to show the view from specific seating areas. This will give fans a perspective of what their seats might be like before they purchase tickets. 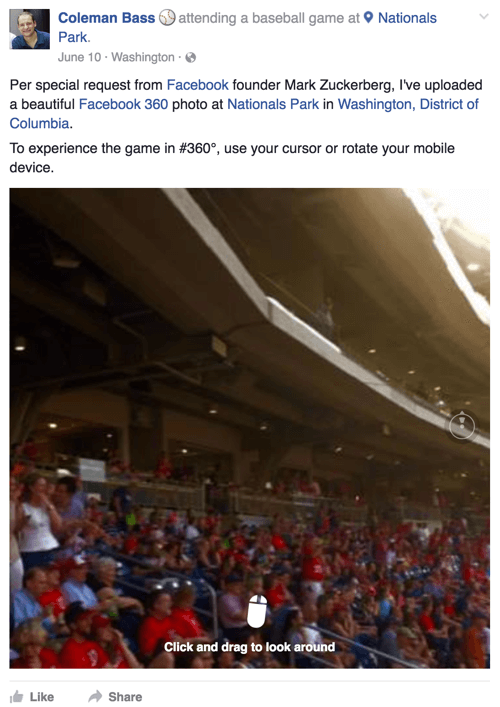 Sports teams, concert venues, and performing arts auditoriums can use Facebook 360 photos to let customers see the view from the seats they are going to purchase. Are you launching a new product? Have you thought about how you can share a sneak peek with customers to keep the energy levels high pre-launch? 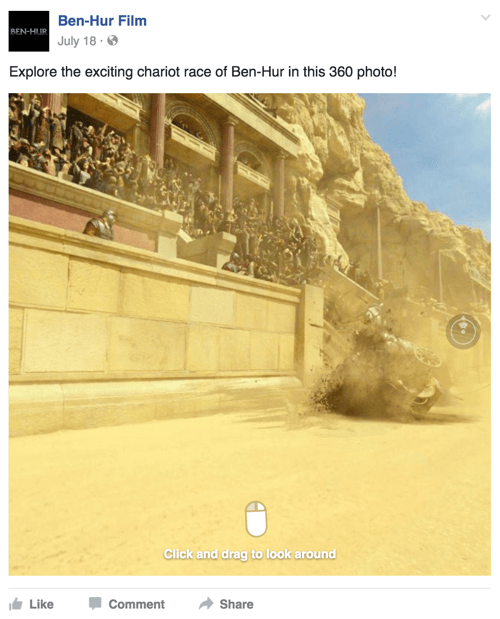 Ben-Hur producers used Facebook 360 photos to promote the modern-day remake of the movie classic. In this post, they shared a still from the chariot race to get fans excited in advance of the movie’s release. Ben-Hur producers shared a Facebook 360 photo of a scene from the upcoming movie to build excitement for the film, prior to its release. If you’re having trouble coming up with your own Facebook 360 photo ideas, consider inviting your fans to take and share 360 photos of your business or specific locations. Create a specific campaign hashtag, such as #MYBUSINESSNAME360, and ask fans to use it when posting their photos to Facebook. Asking fans to share their own Facebook 360 photos of your business or specific locations will let you see what views and experiences they find most interesting. Hopefully, these tips have given you some ideas on how you might use Facebook 360 photos for your business. For example, if you’re in tourism, you might consider taking Facebook 360 photos of some of the exciting opportunities available for visiting tourists. Think beyond the photos typically used in your marketing and show off local hot spots, historic spaces, or public art installations. Think about what your audience is accustomed to seeing, and find something new to show to them. What do you think? 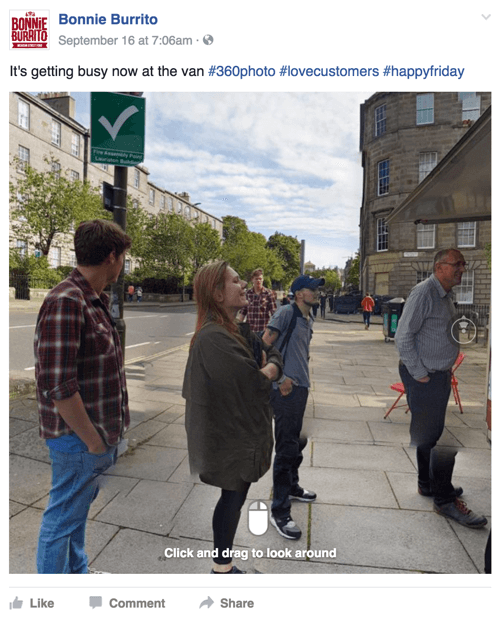 Do you use Facebook 360 photos for your business? Can you think of other creative ways to use them? Please let us know in the comments below! 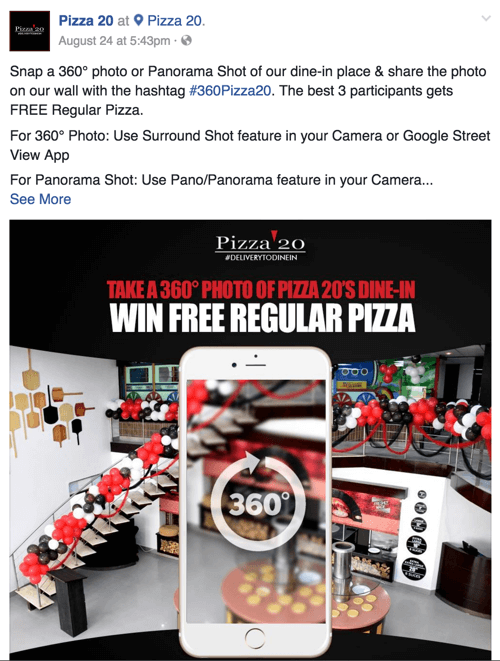 Tips on six ways you can use Facebook 360 photos to promote your business. 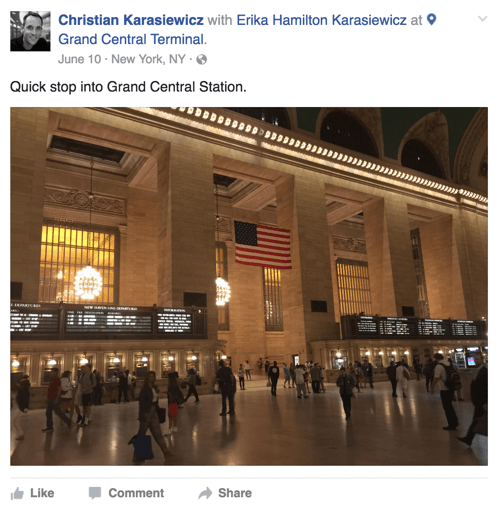 Christian Karasiewicz is a social media marketing professional for B2B and B2C businesses. He's also the founder of Social Chefs, your premier source for social media training on the web.